Past, present or future, never count out The Count! BUYSOUNDTRAX Records, in association with GDI Records, presents DRACULA, A.D. 1972. 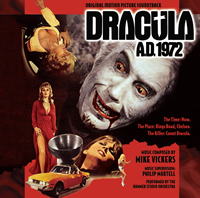 The soundtrack features music composed by Mike Vickers for the 1972 horror film directed by Alan Gibson, written by Don Houghton, with Christopher Lee returning as Count Dracula, Peter Cushing as Professor Van Helsing, Christopher Neame along with Stephanie Beacham and Caroline Munro as the Count’s lovely prey. Attempting to modernize their popular Dracula franchise, Hammer produced DRACULA, A.D. 1972, which finds the Count revived in a modern day setting. The film begins in 18th Century England with the Count fighting his old nemesis, Professor Van Helsing. During the course of their fight, Dracula is killed by a wooden wagon wheel spoke but is revived 100 years later by an ambitious acolyte, to find himself in England of the 20th Century. For DRACULA, A.D. 1972, Hammer’s music director, Philip Martell, chose to go in a different direction with the music, seeking a more modern sound to go along with the film’s modern approach and so Mike Vickers was brought in to compose the music for the film. Vickers had a strong background as an arranger and composer in the early 1960’s, and played guitar and saxophone for the Manfred Mann group during its early period. Vickers’ music for the film is a mixture of orchestral acoustics with electronic instruments, incorporating modernistic, pop-jazz styled rhythms, Gothic tonalities with snare drum, organ and cymbals, reworked with horns, saxophone, bongos and drumkit. In addition to the score, the film features two songs by the American pop band, Stoneground, and atonal electroacoustic music composed by electronic music pioneer David Vorhaus for the black mass sequence. BUYSOUNDTRAX Records presents the original motion picture soundtrack to DRACULA, A.D. 1972 in film order, along with the two songs by Stoneground as bonus tracks. The booklet contains exclusive liner notes written by noted author Randall D. Larson, featuring a new interview with the composer, along with contributions by Caroline Munro. DRACULA, A.D. 1972 is presented by BUYSOUNDTRAX Records and GDI Records, continuing in the fine tradition of GDI’s incredible series of soundtracks from the Hammer vaults. This release is a limited edition of 1500 units. Orders which include the autographed booklets are now being filled. Thank you for your patience.